Today we launched the Nursing Now USA initiative in Washington D.C! This has been an exciting collaboration between the UW School of Nursing, the American Nurses Association, the US Public Health Service Chief Nurse, and the University of North Carolina Chapel Hill School of Nursing. I am thrilled that our school is playing a leadership role in supporting this important global initiative. 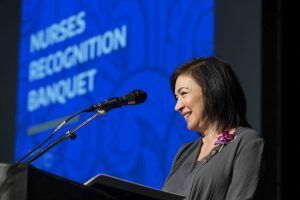 Nursing Now is a three-year global campaign that was launched in 2018 in collaboration with the International Council of Nurses and the World Health Organization with the intent of raising the profile and status of nurses worldwide. This social movement is based on the Triple Impact report that concluded that increasing the number of nurses and developing the nursing workforce will improve health, promote gender equality, and support economic growth. To date, more than seventy countries have embraced this initiative and are working to elevate the role of nurses across the world. Nursing Now USA’s mission is to educate the public on how nurses impact their health and well-being and to ensure nurses are positioned to drive changes that will improve the health for all people. We want to raise the visibility of our profession and showcase how nurses have evolved in the 21st century. We are at the forefront of innovations in research, teaching, and care delivery that has a positive impact on the public. We play a vital role in influencing and creating public policy that promotes and protects the health of all while advocating for conditions that support safe and healthy communities. And, we are fully engaged as leaders locally and globally in the delivery of care by constantly and consistently seeking improvements. As Dr. Kelsey Hirsch, one of our recent alums in our Ph.D. program, so eloquently stated during her “Call to Action” at the Nursing Now USA launch, the nursing profession has evolved and has set the stage for nurses today to work at a higher scope, demand a further global reach, engage in interdisciplinary work across the lifespan, and make real impact on individual lives and society as a whole. My hope is that the Nursing Now USA initiative will help the public understand what the 21st century nurse is capable of and what we do. We ask questions that result in research that informs evidenced-based practice. We incorporate technology into our work so that we can better serve our patients. We provide holistic, life-long education to patients and their families, not only about health and wellness, but also about the tough questions no one likes to talk about such as death and dying. And, we work at the policy setting level to make health care accessible and affordable for all populations. I also hope that this initiative will inspire more individuals to become nurses. If nursing is to truly fulfill the promise of providing quality and just care to all members, groups, and populations in society, we need to engage the next generations of nurses who must be more diverse and eager to push conventional roles, views, and boundaries of nursing. And finally, if we are to achieve health equity for all, nursing – from the frontline workforce in hospital rooms and clinics, to administrators in board rooms, to educators in the classroom, to researchers in labs, and to policy makers in government – must better reflect our society. In closing, I urge all of you to sign up to support this initiative by going to www.nursingnow.org; show up at events and activities that support this effort; and stand up for our profession so that we are seen as vital leaders in health care to make this movement a success for all nurses here and across the world!